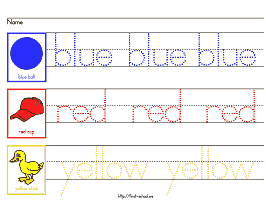 Colors worksheets to learn how to write color words suitable for preschool and kindergarten. Use matching coloring pencils to trace and color. Make sure children practice writing their full name in the top line of the worksheets. After children have practiced with the dotted tracer, practice writing the color words independently using lined paper suitable for preschool, K and primary level.